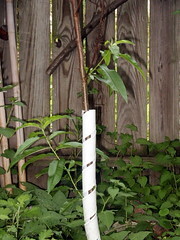 For the first couple years, Peach Twig grew, but only produced leaves. 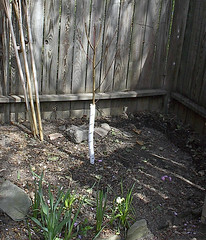 Still it was heartening to know that I had planted more than a twig. The name, however, stuck. Then, a few years back, he (or is it she) grew buds that turned into flowers and then into peaches. However, being totally new at the whole nurturing peaches to maturity thing, she (or is it he) dropped them fairly early. Sad, but still exciting to see progress. Many of the blossoms turned into tiny peaches. 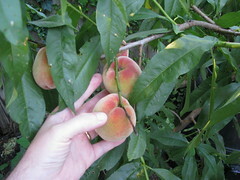 The tiny peaches hung on the tree and got bigger. The bigger peaches ripened. Yesterday, I noticed some of the peaches had fallen, but they seemed reasonably “done.” I took a decent looking fallen peach inside, cleaned it, sliced it open, and tried some its flesh. I went back out to the tree and looked for more “done-looking” ones that were ready to release from the tree (ones that would come off in my hand with the gentlest of tugs.) Of that batch, one or two were not so ready after all, but a couple of others were and they were very peachy. Today I plucked another. Finally, a peach harvest. How exciting! Maybe she will hire her services. But, not for long, she’s a growing girl. I love the not-to-be-distracted guy who carries on cleaning the glass doors.